The Venus flytrap (Dionaea muscipula) is the most recognizable carnivorous plant, and its exotic appeal has made it a popular house plant. Though often marketed as easy to grow, Venus fly traps are sensitive plants, native only to bogs and swamps in North and South Carolina. Fly traps have very specific growing requirements, and need a moderate amount of care in order to flourish in captivity. Feeding a Venus fly trap chicken, beef or other animal meat will cause the plant to rot. Venus fly traps are unable to digest the fat from mammals. Fly trap owners should not feed the plant caterpillars, which may chew their way through it. 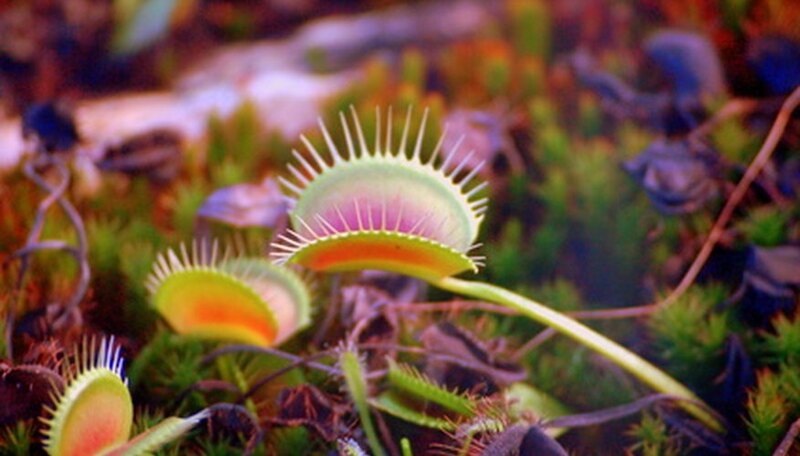 Other "food" that Venus fly traps cannot tolerate are ants, butterflies and beetles. The plants only need to eat about once a month or less, and can usually catch their own food--especially outdoors. Though playing with the plant may be fun for the owner, it overexerts the Venus fly trap by forcing it to close its trap more than necessary. Putting your finger in the trap to watch it close, for example, will weaken the plant. If the plant is too weak, it won't close its trap fully when it does catch prey, thereby losing its nutrients and essentially starving. A fly trap shouldn't close its trap more than once or twice a month. Venus fly traps will die if they don't have the correct growing conditions. They require strong natural light and humidity, but too much heat will kill them. If the natural environment is not humid, grow the Venus fly traps in a terrarium and lightly misted them three times a week. Wet, soggy soil can also harm a fly trap; although the soil should be moist, it needs to drain. Putting gravel on the tray below the plant's pot can help drain water. Venus fly traps should never be planted in potting soil or directly into outdoor soil. The ideal soil for a fly trap is low in nitrogen, a mix of about 70 percent peat moss and 30 percent sand. Plant owner might not recognize the Venus fly trap's natural period of dormancy during the winter (typically between November and February), when it appears to be dead. Once nighttime temperatures hit about 50 degrees Fahrenheit, Venus fly traps will go dormant. Keep the terrarium humid, but water the plant less and continue to give it at least some daily light. Carefully trim away any dead leaves.